Amazing Layered Carrot Cake with Cream Cheese Frosting. 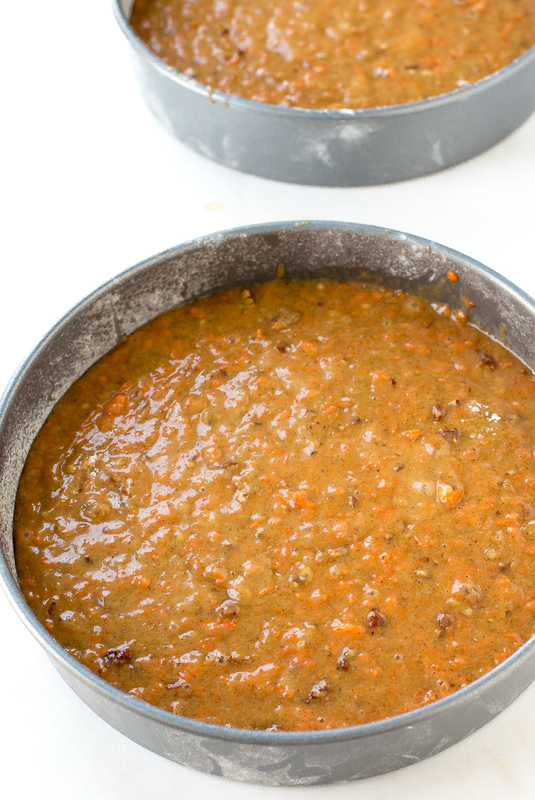 Super moist, soft with the perfect amount of spice! 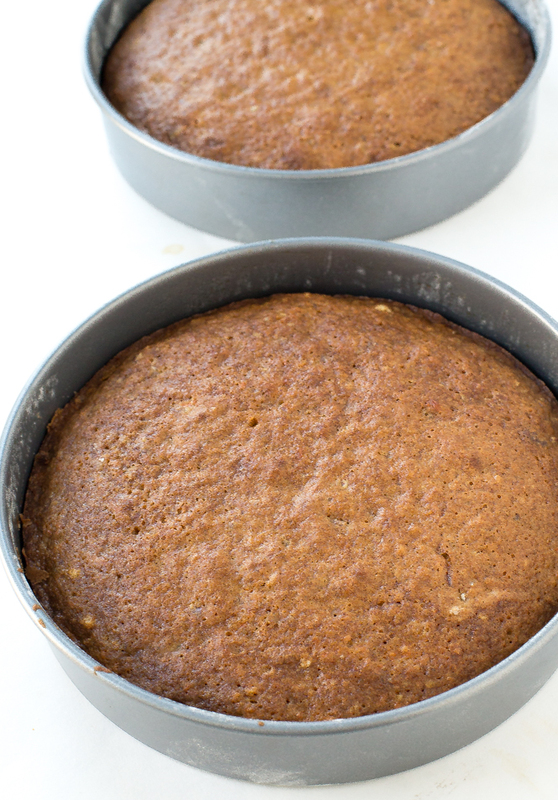 Carrot Cake is one of my favorite desserts aside from my favorite Chocolate Cake. I love my Carrot cake loaded up with walnuts and topped with tons of cream cheese frosting. 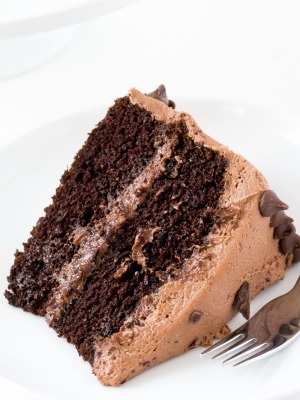 This cake is actually pretty easy to make. 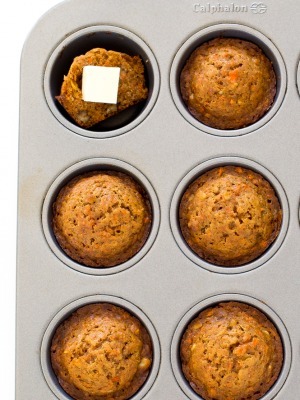 Combine your dry and wet ingredients separately. Fold the wet ingredients into the dry then fold in the carrots and nuts by hand. Pour the batter into the prepared pans and bake for 30-35 minutes. You can make either a two layer cake with 2 9-inch pans or a three layer cake with 3 8-inch cake pans. Just make sure to adjust the cooking time. I find that the flavor of this cake develops the longer it sits. I like to make it a day or two ahead of time and frost the day of. The cream cheese frosting is by far my favorite part of this cake. It’s creamy, rich, buttery and slightly tangy. It’s the perfect topping for this cake. I added nuts to the carrot cake but they are optional if you are not a fan. Raisins can be added as well. 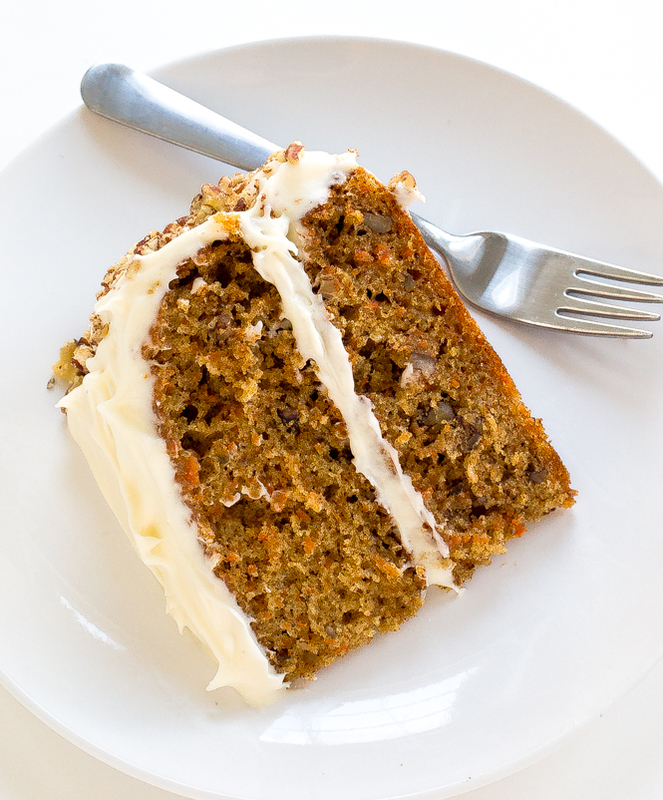 When you are making this cake I suggest you shred up the carrots in a food processor versus a grater. It saves a lot of time and is less of a mess. You can always grate them by hand if you do not have a food processor. 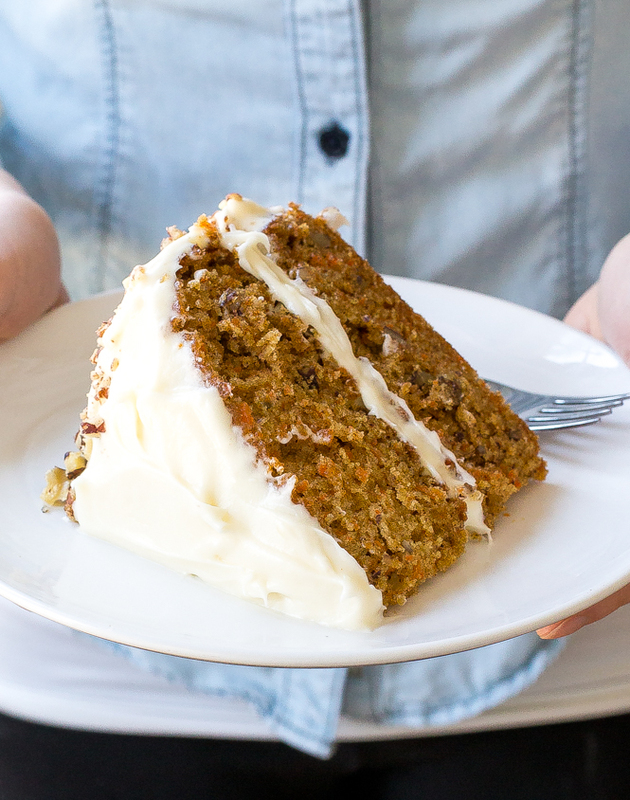 This Carrot Cake is the perfect dessert for Easter! Enjoy! Grease two 9-inch cake pans with cooking spray. Line the bottom of the pans with parchment rounds and spray parchment with oil then dust with flour, tapping out any excess flour. Add flour, baking powder, baking soda, salt, cinnamon and nutmeg to a large bowl. In another large bowl combine eggs, oil, apple sauce and both sugars. Add the wet ingredients into the dry ingredients and stir just until combined. Try not to over mix. Fold in carrots and nuts by hand. Pour the batter into the prepared pans and bake for 30-35 minutes or until a toothpick inserted comes out clean and without any crumbs. Allow the cake to cool for 10 minutes in the pan and then run a butter knife around the edges of the cakes and flip the cake out onto a wire rack. Peel off parchment paper and flip the cakes again so it is the right side up. Allow to cool completely. Frost cake and serve immediately or store in an airtight container in the fridge. 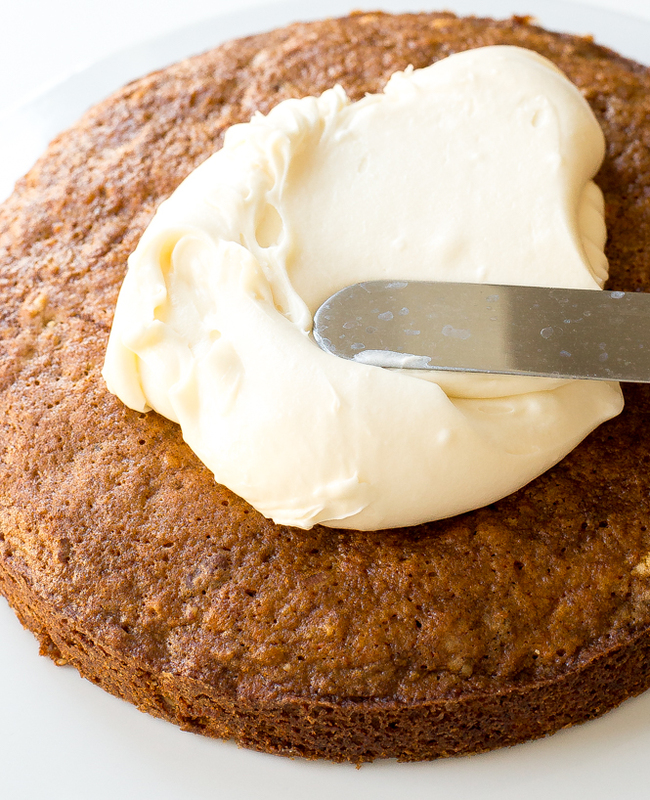 Add butter and cream cheese to a stand mixer with the paddle attachment. Cream until fluffy, 2-3 minutes. Stir in powdered sugar and vanilla and mix until combined and clump free. Set aside until ready to frost the cake. 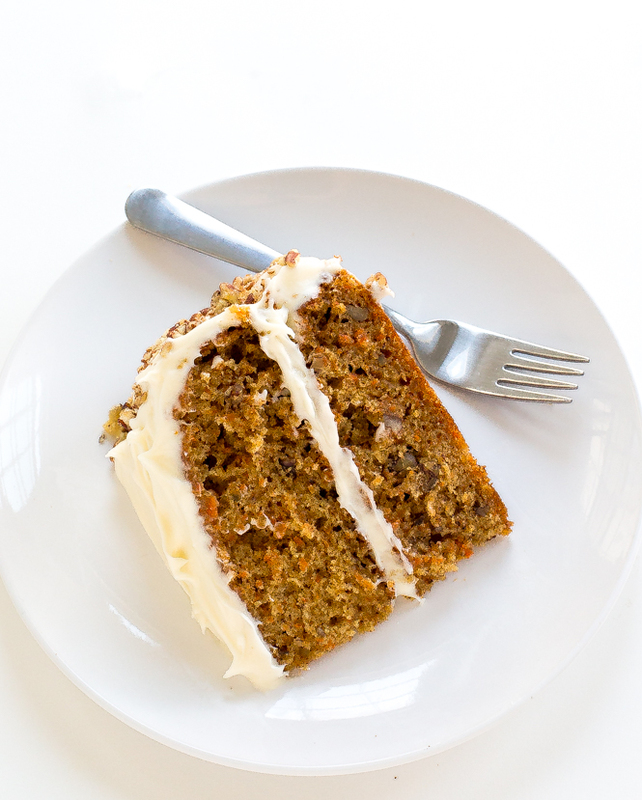 I love carrot cake around this time of year, yours look so delicious, pinning and sharing! Thanks so much for catching that error. It is 1/4 teaspoon! I have updated the recipe. Yes the batter is enough for two 9-inch cake pans. As for the apple sauce it is necessary for the cake. If you do not have any on hand you can substitute an equal amount of crushed pineapple.